Amid sporadic incidents of violence, large scale arrest of opposition workers, reports of electoral malpractices and death of 17 people on polling day, Sheikh Hasina’s Awami League (AL) won a landslide victory in the December 30, 2018 parliamentary elections in Bangladesh, securing the ruling Grand Alliance Coalition 96% of the vote. The AL secured a record third consecutive term, winning 288 of the country’s 300 (298 voted) parliamentary seats, with its allies. The Bangladesh Nationalist Party (BNP) and its electoral partners managed to capture only 7 seats in Bangladesh’s first fully contested election in a decade. However, the opposition rejected the poll verdict, calling it “farcical”, marred by violence, intimidation and vote rigging accusations. Earlier in 2014, the BNP boycotted the parliamentary polls, alleging it was rigged in favour of Hasina and her party. The AL’s opponents were lethal in their attacks against the ruling coalition, accusing it of crippling the opposition particularly, the BNP, and paving way for single party rule in Bangladesh. The AL government has dismissed allegations of intimidating the opposition, and instead blamed the BNP of indulging in vandalism to disrupt the poll. These allegation and counter allegations are usual components of Bangladesh’s political dynamics. Since the 1990s, the country has witnessed bitter rivalries between the two major contenders of power—Hasina and BNP chief, Khaleda Zia. The political temperature of Bangladesh reaches its peak during parliamentary elections. But such hyperbole was less this time as Hasina’s rival Khaleda is reportedly seriously ill, facing an uncertain future in jail after being convicted for graft in February 2018 and sentenced to a 7 year prison term, and could not contest the poll. Bangladesh is a highly politicised country and most of its vital institutions are co-opted by the ruling party. BNP supporters believe that the charges against their leader Khaleda are politically motivated. Her exiled son, Tareque Rahman, the acting party head, was also sentenced to life in prison. The BNP initially decided not to take part in the 11th Jatiya Sangsad elections while its top leader was in jail. However, considering that the party could have lost its registration with the Election Commission (EC) if it boycotted national elections for a second consecutive term, it opted to contest at the head of an opposition coalition called Jatiya Oikya Front (National Unity Front). 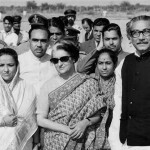 Hasina’s victory was widely expected in the country’s current political scenario. The BNP is now in disarray and not in a position to challenge Hasina, who has outmanoeuvred Khaleda politically, taking advantage of the two time former premier’s poor credibility rating. The political landscape of Bangladesh has undergone a major change in recent years. Hasina has consolidated her grip on power even though her detractors say that she has become authoritarian in the process. Some believe that after Hasina’s current term, the BNP will be virtually extinct. Many accuse the Hasina government of police highhandedness while dealing with dissent. The government faced sharp criticism for its inept handling of the recent students’ protests that had brought the capital Dhaka to a standstill. Hasina’s critics say her government has enacted draconian laws to punish people for speaking against the regime. The new Digital Security Act empowers the police to monitor people’s activity online and arrest critics without warrants. This stringent law has created an ambience of fear in the country. At the same time, it can not be denied that Bangladesh has made considerable progress in many areas. The Hasina government is credited for efficiently tackling pressing issues, including the disastrous impact of climate change, Islamic militancy, endemic poverty, growing unemployment and electricity crisis. Bangladesh currently has the best socio-economic indices among South Asian countries because of the government’s policies and programmes, and its development strategy is seen as role model for least developed countries. Under Hasina, Bangladesh has experienced rapid economic growth and social development, particularly in rural areas. According to the World Bank, Bangladesh’s per capita income has increased 150% and share of population living in abject poverty has reduced to about 9% from 19%. The rates of maternal mortality and illiteracy have come down too. Power generation has increased significantly, boosting factory production and spreading to homes in rural areas. The country has also emerged as the world’s second-largest exporter of readymade garments, after China. Bangladesh has achieved relative political stability, helping its GDP to grow at 7.8% during 2017-18. In its election manifesto, the AL vowed to raise Bangladesh’s GDP to 9% and completely eradicate extreme poverty, if re-elected. Bangladesh could surpass the per capita income of its bigger neighbour India, by 2020, and is also poised to emerge as middle-income economy by 2024. The government’s efforts for digitisation and bringing Madrassa degrees on par with those of modern educational institutions has helped generate employment opportunities. The government’s efforts to provide shelter to millions of Rohingya refugees fleeing a military crackdown in neighbouring Myanmar have been widely appreciated. Hasina’s thumping victory has been welcomed by several nations. India’s Prime Minister Narendra Modi was the first foreign leader to congratulate her and said Indo-Bangladesh ties would strengthen further under Hasina’s “far-sighted” leadership. Bilateral engagement between Bangladesh and India has vastly expanded in recent years. At the top leadership level, there have been 10 meetings between Modi and Hasina, six video conferences and five telephonic calls in the almost five years. On the economic front, 19 development projects have been inaugurated jointly by them and more than 90 bilateral agreements signed in diverse areas including connectivity, energy, space, information technology, cyber security and civil nuclear energy. India is among the most important development partners of Bangladesh after Hasina assumed office in 2009. New Delhi’s development assistance has increased from $ 3 billion to over $ 7 million and bilateral trade from $ 7 billion to $ 9.3 billion in the last two years. Hasina’s return to power is also a positive development for India’s security, especially in the context of threats posed by cross-border terrorism. Both South Asian neighbours will further broaden and deepen their counter-terror cooperation in the coming days. is an independent analyst on India’s Northeast and Southeast Asia. Will Khaplang’s death alter course of Militancy in India's North-East?